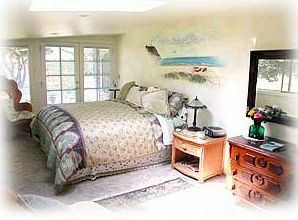 Boreas Bed and Breakfast Inn is an ocean-front, romantic B&B on the Long Beach Peninsula near the Pacific Ocean with gourmet breakfasts and luxurious beds for a dreamy nights' sleep. The Bed & Breakfast Inn has 5 beautiful suites with private baths, one with jacuzzi tub. Our inn is located just 3 hours south of Seattle, Washington, a little over 2 hours west of Portland, Oregon and just a few minutes from Astoria, Oregon. While on your trip visit dramatic lighthouses, go antique shopping, just fly a kite on the beach, or just spend private time together in the cedar-enclosed therapeutic hot tub near the ocean dunes in Long Beach, Washington. Tariffs include a full, delicious breakfast. There is no smoking allowed at the Inn. There are, however, designated smoking areas outside. Check-in time is between 4-6 p.m. Check-out time is 11:00 a.m. This and other Washington State Bed and Breakfasts can be found here online in The Register.